The title of this recipe is a mouthful, am I right?? Well, the entire dish was an amazing mouthful, so well worth the long name! This pulled pork taco dish comes from the amazing blogger over at How Sweet It Is. I am on-and-off obsessed with her recipes, because they are most often quite delicious, and she is a funny and quirky writer. The downside is that they are often very elaborate dishes and not usually “everyday” kind of dinners. My husband and I had an at home date night last Friday and I decided to make these and we watched Divergent (we are watching the second one tonight, and I cannot wait for the third one to hit the theatres!). This dish is AMAZING. Seriously, it’s amazing. But it is also a heck of a lot of work, so be prepared for that. I did realize that going in. The pork itself is pretty simple because it just cooks away all day in the crockpot. The mango salsa is a bit time-consuming to chop and throw together but pretty basic. Can I also say that I just love fruit salsas? A close friend of mine haaaaates them (you know who you are ;)) but I just love them. They are definitely not sweet (as most of you know, I hate overly sweet things), and the onion, cilantro, etc. that is also in them usually counteracts any sweetness. I will say that one mango is perhaps not enough, because the mango did not get to shine enough, but I ended up adding extra onion too, since I had some leftover. But let’s talk about the onions. Oh, the onions. They are WORK, my friends. I stood over the stove for what felt like forever frying up these babies. I used a stock pot, but an entire onion thinly sliced takes awhile to fry. I also want to mention that adding the salt as soon as each batch is done frying is essential. I taste-tested one (ok, ok, a lot) pre-salt and taste-tested some post-salt, and the post-salt definitely won me over. I didn’t use much, just a quick grind, but it really packs a punch on the hot, fresh from the frying oil coated onions. That being said, they are definitely essential for these tacos. Yes, store-bought is WAY easier, but you will not be sorry for frying up these babies. Keep in mind to only make what you will use for that serving, as they don’t really re-heat super well. -Heat a large skillet over medium-high heat and add about 1-2 tablespoons olive oil. Sear the pork on every side (about 2-3 minutes per side) until golden brown before adding to the crockpot. -Add pork to crockpot with onion powder, garlic powder, paprika, salt and pepper. Add beer and 24 ounces of barbecue sauce. Cook on low for 8+ hours, tossing once or twice if desired. -After 8 hours, shred pork with forks and add remaining barbecue sauce. Toss pork to coat and let sit for 10-15 minutes before serving to absorb everything. Remove bone (if bone-in) before serving. -To assemble your tacos, layer pork, mango salsa, cheddar cheese, and onion straws on the tortilla, fold up, and enjoy! The crispy onion straws come from the genius blogger, My Life as a Mrs.
-Preheat oil in a deep pot to 350°. -Add onions and buttermilk to a large bowl and toss until combined. In a second bowl, mix together flour, garlic powder, salt, black pepper, and cayenne. -In small batches, take the buttermilk coated onions and dredge in the seasoned flour (shaking to remove excess flour), and fry for 1 1/2 – 2 1/2 minutes on each side (or until golden and crispy). Place on a paper towel line platter and sprinkle with a tiny bit of salt. Repeat until all onions are golden and crispy. I was so excited for this dish. Like…so excited. It looks all comforty and creamy and pasta-y and amazing. 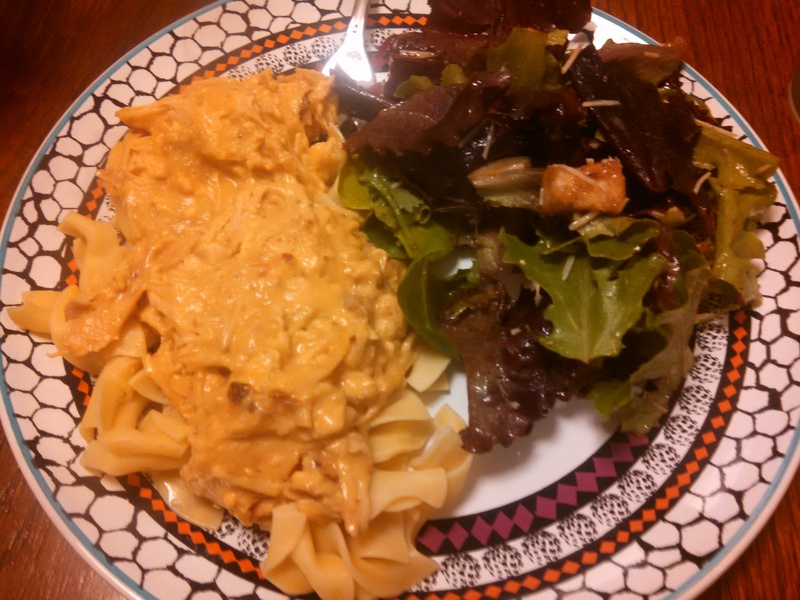 It is creamy Italian chicken from Life as a Lofthouse’s blog. That blogger also created a really yummy tater tot casserole in the past. However, this dish fell a little flat, in my opinion. It ended up being overly salty. The likely culprits are the seasoning packet and the cream of chicken soup. Maybe next time, I would see if there was a “low sodium” seasoning packet option…another idea is to do a homemade seasoning mix, and omit any salt ingredients from it, which would likely be easy enough to do. Anyway, this dish was edible, but again, just salty. It was even almost too salty for my husband, which is saying a lot. So, I think had I lowered some of the salt ingredients, this dish would have turned out much better. Let me know if you make it and what your thoughts and changes are! -Spray the crock pot with non-stick spray, then place the chicken breasts in it, and sprinkle the Italian dressing mix over the tops. Pour the cream of chicken soups over chicken, and then spread the cubes of cream cheese evenly over all. -Cover and cook on low for 6 hours (or high for 3 hours). Remove the lid and stir mixture together. Cut chicken into bite-size pieces (If the sauce seems too thick, you can thin it out with a little milk). -Serve chicken and sauce over cooked egg noodles or rice. I am prefacing this post to apologize for my sucky pictures. 😉 I just couldn’t get a flattering one. If you want to see yummy looking pictures of this dish, then definitely click on the original blogger’s link! Thai food is basically one of my favourite things in the entire world. I suppose I should really say that Phad Thai is one of my favourite things in the entire world. I love the other stuff too (showering rama, curry, anything smothered in peanut sauce, etc. ), but Phad Thai is really where it’s at. That being said, I think I am testing out a new Thai restaurant on Sunday with a friend – can’t wait! I had found a Thai chicken soup recipe awhile ago that I was excited to make, but also dreading, as it contained 50 bajillion ingredients, but when the time came that I planned to make it, apparently the site was marked as spam and disappeared. Such is life. 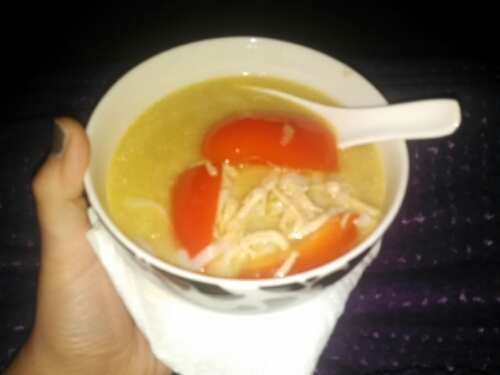 In any case, I did find this close replica of Slow Cooker Thai Chicken Soup by Bev Cooks. This contains a lot (but not as many) ingredients, and can be done with the ease of a slow cooker. Win win! The downside of this recipe was that I was making it for my husband as well as a dear friend that adores Thai food like I do, but can’t have any corn products. I read the ingredient labels of everything super carefully and then dumped it all in the slow cooker. Right after doing so, I discovered that cornstarch was on the ingredient list for the chicken broth. After a minor freak out, I decided to still make the soup (obviously I wasn’t going to just dump a perfectly good meal), and then scrambled to make something else for dinner that evening. 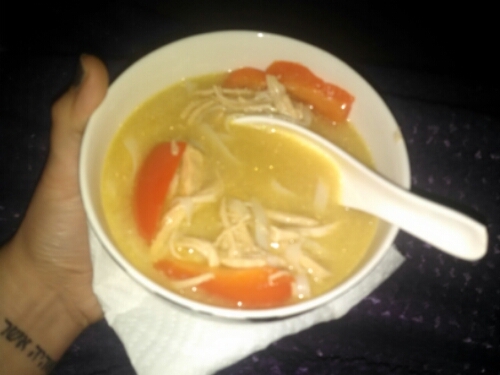 The moral of the story is that my husband and I ended up with tons of leftovers of this yummy soup! I didn’t add in the rice noodles until the next day when we planned to actually eat it, because I didn’t want them to get soggy and gross. I also had about 3-4 days of leftovers for lunch. Speaking of rice noodles, mine NEVER, EVER turn out the way they do in Phad Thai dishes at restaurants, even though I follow the package instructions super closely. They don’t turn out badly (aka soggy and mushy), but they’re not as good as they are in restaurants. If anyone knows the secret of perfect rice noodles, pleaaaaaase let me know! -In a slow cooker, add the coconut milk, broth, garlic, ginger, chicken, soy sauce, a pinch of salt and freshly ground pepper. Cook on high for 3 hours. -Remove the chicken from the crockpot and shred it with two forks; return to pot. Add the rice noodles, bell pepper and sprouts, and cook for 30 more minutes. Taste and add more salt and pepper if needed. -Serve each bowl garnished with sliced jalapeno, a good handful of cilantro and lime juice. 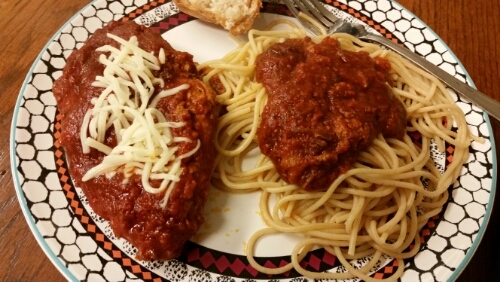 Who loves chicken parm? ME!! I DO!! Ok, sorry to start off sounding so dorky, haha. But I really, really do love chicken parm. In any and all forms. 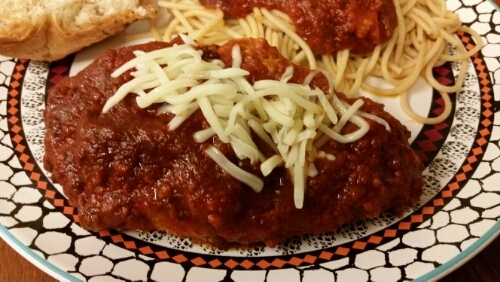 Even odd but delicious ones like these chicken parmesan meatballs and also the chicken parmesan meatball soup I made awhile back. YUMMM. It really is not that hard to make, but what is a way to make it even easier? The crock pot! 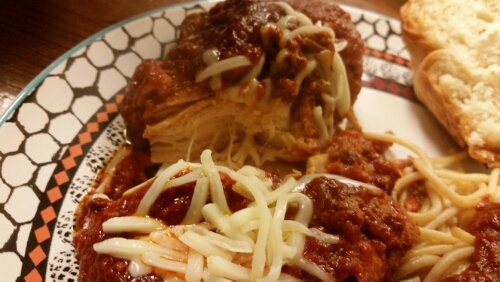 Thanks to Stephanie O’Dea’s “chicken parmesan crock pot recipe” over at A Year of Slow Cooking, I was able to do just that! 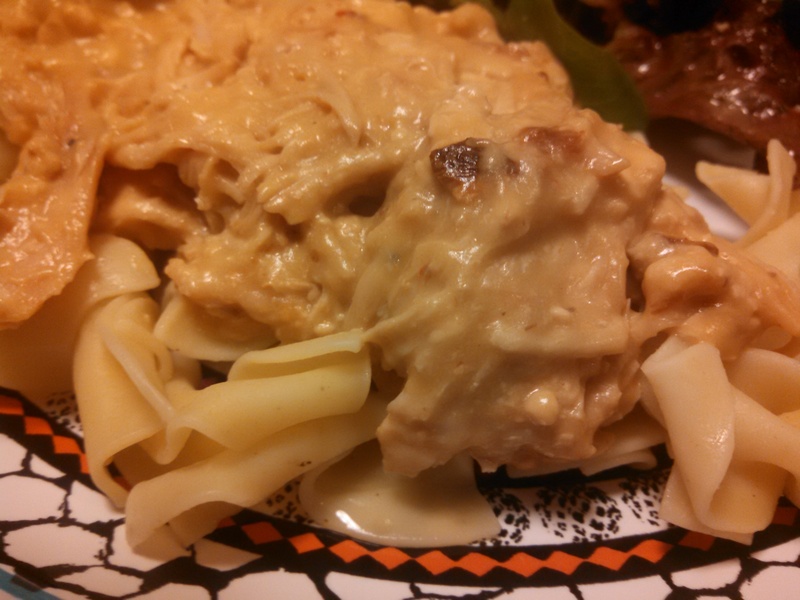 I was a bit wary of putting cheese in the crockpot for 8 hours, because I’ve heard mixed opinions of it sometimes getting rubbery, or sometimes being fine. 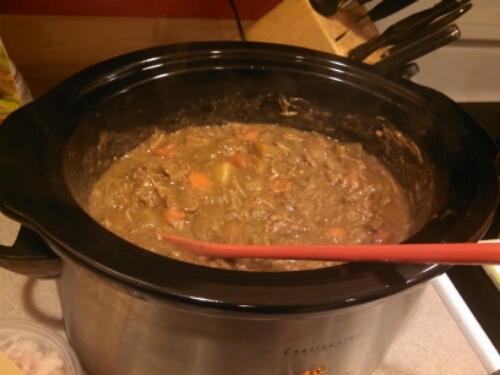 As you can see in the pictures, I did put a little cheese on it in the crock pot, and then added more at the end. Nice to come home to dinner *almost* ready! (just had to boil some pasta). -Spread 1 tablespoon of olive oil into the bottom and sides of your crockpot. -In a separate bowl, whisk the egg with a fork, and in another separate bowl, mix the bread crumbs with the seasoning and parmesan cheese. -Dip each chicken breast into the egg, then into the bread crumb mixture, coating both sides with crumbs, cheese and seasonings. -Place the chicken breast pieces in the bottom of the crock, then layer the mozzarella on top. -Serve with your favorite pasta. Hot food season is definitely upon us! Here in the Pacific Northwest it has dipped down into the 20s in the early morning and late evening, and I know that many parts of the country are getting their first snowfalls! I have really enjoyed seeing the pictures circulating on Facebook from my friends in Albany, NY (where I used to live), as they got their first snowfall of the season a few days ago. 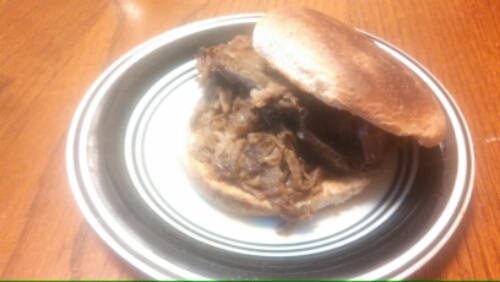 Soups and stews are GREAT, but in case you’re tired of “the usual,” then this slow cooker barbecue beef sandwich recipe is perfect! The recipe comes from Eat 2 Gather’s website, however is a guest post by Just For Clicks, which appears to now be defunct (it looks like the recipe came from Southern Living Slow Cooker Cookbook originally). This is an “easy-peasy” recipe (ugh, that saying really annoys me, but I know it’s really popular right now), that you can throw together in the morning and then have a delicious smelling and tasting dinner in the evening! I apologize for the weird, glossy/shiny looking pictures. I don’t know how that happened. But this is really good. -Sprinkle roast with 1 teaspoon salt. -Stir together remaining salt and all of the other ingredients (except buns, obviously). 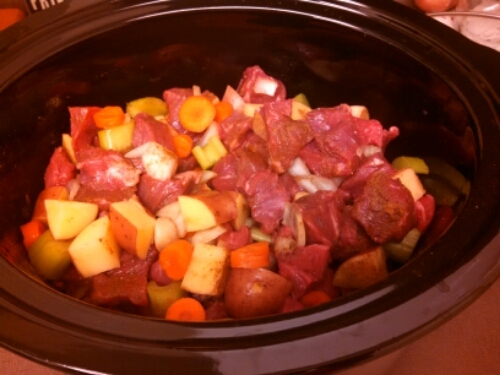 -Add beef to slow cooker and then pour sauce over beef. -Cover and cook on low for 8+ hours (ok, the original recipe said to cook on high for 7 hours, but I have NEVER seen that before…I cooked mine, already mostly defrosted, on low for 8-9 hours, and it was perfect). 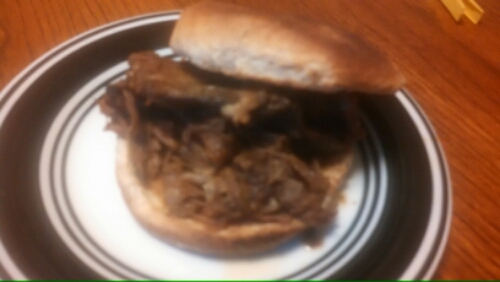 -Shred beef and serve on buns. Sometimes you just want something yummy and easy…but not too easy. 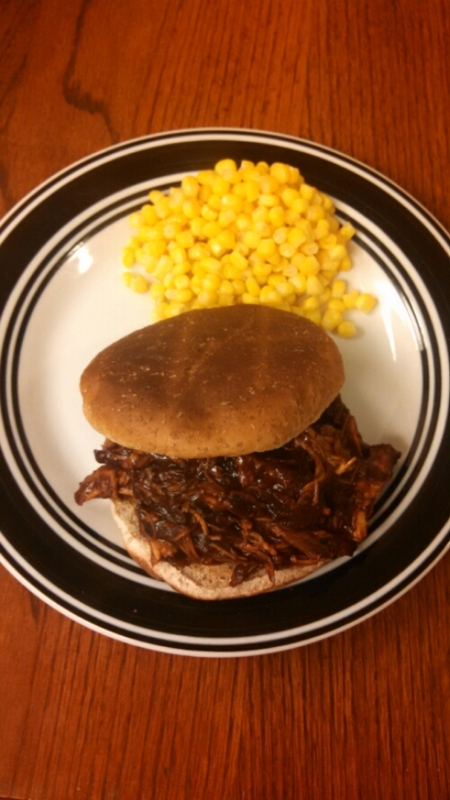 This barbecue chicken sandwiches in the slow cooker recipe by Eat at Home is just that! It requires just a touch of prep time the morning of (or night before), but then you walk into your home after a hard day at work and dinner is ready (minus a few minutes for bun-toasting). If you really are looking for something yummy and super easy, then you can just as easily throw chicken with just some barbecue sauce (Sweet Baby Ray’s, anyone?) in the slow cooker. But this recipe does add a little something extra, with the extra spices, onion, etc….just a little more “oomph” as they say. Also – it is a great way to use up some of the liquid smoke I bought awhile back for other recipes, that I’ve hardly touched since! Also, if you are worried, liquid smoke is only $2 a bottle, depending on where you go. I’ve still only used it a few times and I’m honestly not sure what it adds, but it must add something! Side note: the original recipe calls for 3lbs of chicken (which serves 10-12 people). I only used two chicken breasts, which serves 2-4, depending on appetites, and I adjusted the other ingredients accordingly. Feel free to click between my blog and the original blog, to get the ingredients right for the amount you have! 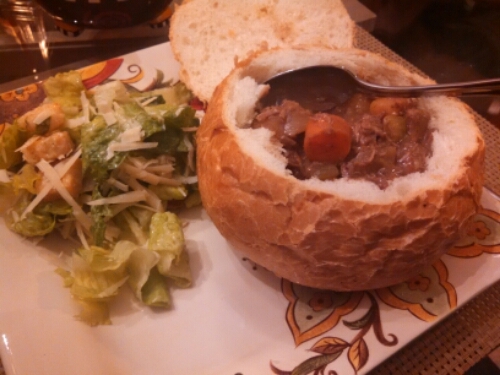 -Toss all the ingredients into the slow cooker. Stirring is not necessary, but I did. -Cook on high for 5-6 hours or low for 7-8. -Shred the meat and stir it until well-combined. Serve on buns – or even in pitas, tortillas, or if you’re light on carbs, over a salad!